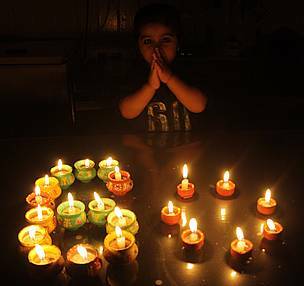 Lights were turned off in homes, businesses and public buildings in Fiji and New Zealand at 8:30 PM local time as Earth Hour 2011 began. There was widespread endorsement of the message that the world and its environment need commitments for action going “beyond the hour”. By the time the event ends in the Cook Islands, 24hrs after the first light switch was turned off, hundreds of millions of people in thousands of cities, towns and communities in a record 134 countries on all continents are expected to have participated. In Fiji, lights were turned off but not the television sets as the island nation got set for the face off against Kenya in the all important Hong Kong Rugby Sevens. At Davis Station, Antarctica, the lights will go off - but not the heating - as scientists settle in for a candlelit dinner. In some countries, the national, regional and especially municipal leaders have taken major roles in organising Earth Hour activities. In Swaziland, the driving force behind Earth Hour will be 15 year old Nathi Mzileni. UN Secretary General Ban Ki-moon urged all to “use 60 minutes of darkness to help the world see the light”. Earth Hour has dominated as a topic on social networking channels over recent days with Australian international model Miranda Kerr “hijacking” the Myspace homepage for Earth Hour. The core Earth Hour accounts have garnered more than half a million Facebook fans and nearly 50,000 followers on Twitter, with many more following country specific accounts supporting the cause. YouTube also displayed a customised doodle across the site for Earth Hour, while a light switch appearing above each video allows users to darken the YouTube host page. The world of show business and the world of sport also got behind the event, with leading stars in many countries taking part in Earth Hour events. Leading sports institutions lending their support included the world’s largest football club, Real Madrid, London’s Olympic organising body and the European football federation UEFA. London’s 02 Arena joins a host of prominent sporting venues taking part in Earth Hour, including Chicago’s Wrigley Fields, and the Water Cube and Birds Nest in Beijing. “The list of official participants always falls short of the real levels of participation,” Earth Hour co-founder and executive director Andy Ridley said from the top of the Sydney Harbour Bridge soon after the lights faded in the city where Earth Hour was born. “We always find out after the event that Earth Hour has been observed in countries that have never contacted us, cities we would never have expected and places we haven’t heard of. Wet conditions failed to dampen the enthusiasm for Earth Hour celebrations in New Zealand - although the event was also tinged with sadness as participants recalled the former key role of the city of Christchurch, devastated by an earthquake last month. In the capital, Wellington's Mayor Celia Wade Brown switched off lights for the Earth Hour event at the Carter Observatory. Speaking at the event, WWF-New Zealand Executive Director Chris Howe emphasized the collective power of the Earth Hour global movement: "When we take small actions as part of a global community, we can make a big difference and create a future where people live in harmony with nature," he said. In Auckland, the Sky Tower - the tallest free standing structure in the southern hemisphere - switched off lights, Hamilton's Earth Hour revellers braved thunder and lightning to attend Earth Hour 'lights out' events at restaurants and bars, and people in Alexandra enjoyed music by candlelight in Centennial Park. Beyond the hour activities for Earth Hour have been most comprehensively embraced in Tauranga, a coastal city south of Auckland, with 41 businesses and organisations committing themselves to environmental action, including students planting 1000 trees along the expressway and the Port of Tauranga pledging to cut energy use. Australia’s participation in Earth Hour began as the lights dimmed on one of the world’s most noted dual landmarks - the coat-hanger and sails combination of the Sydney Harbour Bridge and the Sydney Opera House. The cascade of commitments for beyond the hour activities went well beyond Australia’s largest city. Prime Minister Julia Gillard to do all she could to secure a price on carbon to combat climate change causing emissions, to new bikeways and LED lights for parks and streets. WWF-Australia and partners also introduced Earth Hour Awards for outstanding contributions to the environment; an initiative that may be rolled out around the world for future Earth Hours. 15 year old Parrys Raines convinced her Woollongong school to install water filling stations and provide each student and teacher with a reusable stainless steel drinking bottle to reduce plastic bottle waste. The Australian Earth Hour, along with many others, commenced with a minute’s silence for the victims of the catastrophic earthquake and tsunami in Japan earlier this month. 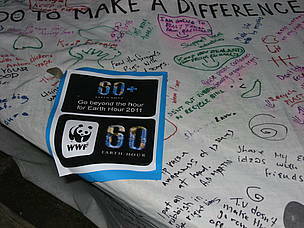 Earth Hour events in some countries included fund raising to assist earthquake and tsunami victims. In Japan itself, a small Earth Hour team demonstrated the resilience and resourcefulness shown by the country since the dual disaster by putting their emphasis on promoting 20 ways for Japanese people and businesses to save energy as a practical way to provide assistance to devastated areas. The lights were turned off out on the Tokyo and Kyoto Towers and the castle and peace memorial in Hiroshima. 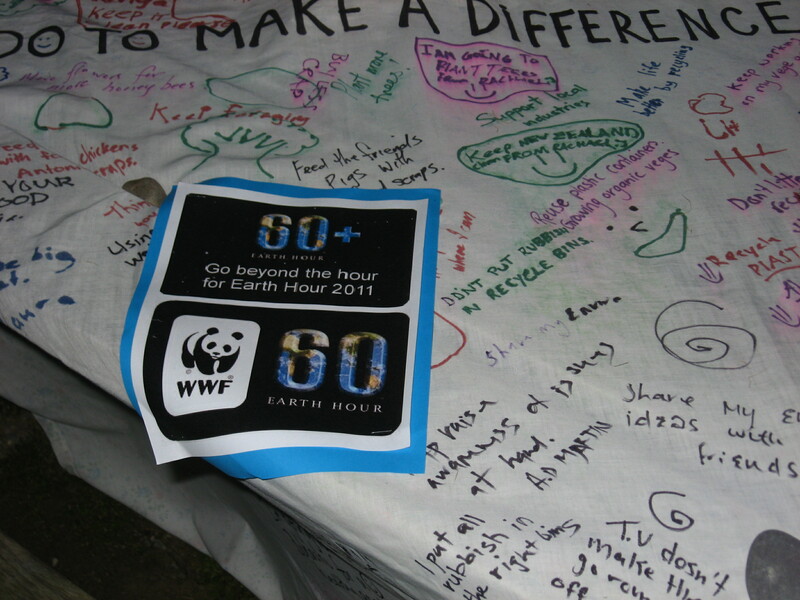 The League of Cities and League of Municipalities ensured an overwhelming turn-out for Earth Hour in the Philippines by signing up 1661 cities and communities for the event After a minute’s silence for Japan and the planet, acoustic performances provided low-carbon entertainment at the switch-off event. The Department of Energy Secretary Rene D. Almendras lit the official candle outside the Mall of Asia at Pasay City followed by the vice president of The Philippine’s Climate Change Commission. A long line of government and company representatives, celebrities, regional representatives and students then lit their candles from the official candle and recited their pledges for beyond the hour actions for the environment. Other pledges flooded in from the municipalities. Makati City announced a ban on plastic shopping bags and plans to promote the use of locally handcrafted bags. One and a half year old Avi joined her family in observing a moment of silence for the victims of the Christchurch and Japan tragedy during Earthhour 2011.